As we all known, the die mould heat treatment is to make use of the die mould materials potential to improve its using performance. The performance of the die mould must meet: the high strength(including high temperature strength, hot and cold fatigue resisting performance), high hardness(abrasion resistance) and high tenacity, and also requires good machinability(including good polishing), weldability, corrosion resistance and so on. The greatest impact on die mould life is the design of the die mould(including the correct selection of materials), materials, heat treatment, usage, maintenance and so on. If the die mould design is reasonable, high quality materials, then the heat treatment will directly determine its life. Nowadays domestic and overseas are trying to use more advanced ways of heat treatment to improve the performance of the mold to extend the service life. The vacuum heat treatment is one of the most advanced ways of mould heat treatment. Therefore, from the view of mould heat treatment, heat treatment processing equipment, heat treatment technology and the production process control are particularly important. The advanced equipment is to ensure that the premise of achieving advanced technology. 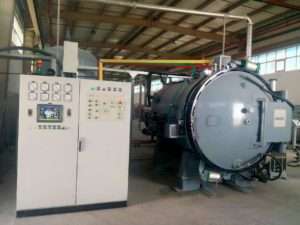 High pressure vacuum gas quenching furnace is the ideal vacuum heat treatment equipment. Vacuum furnace with no decarburization, no oxidation effect, with uniform temperature, heating and cooling speed control, can achieve different processes. Vacuum furnace with no any pollution, is internationally recognized as “green heat treatment”. Now has 2-20bar high pressure vacuum gas quenching furnace., it can fully meet the requirements of the vacuum heat treatment mould. During mould processing, the process parameters has a crucial impact on the mould performance: including the heating temperature, heating speed, heat preservation time, cooling way, cooling speed and so on. The correct heat treatment processing parameters can ensure that the mould to obtain the best performance. On the contrary, will produce bad or even serious consequences. Practice indicates that the correct heat treatment process can get excellent organization, excellent tissue morphology in order to ensure excellent mechanical properties. The appropriate process method can effectively control the deformation and cracking of the mould during heat treatment. It is found from the practice that the difference between the mould surface temperature and the heart temperature during heating and cooling (the inhomogeneity of heating and the nonuniformity of cooling) is the main factor causing mould deformation. (Vacuum furnace. has the ability to control the heating rate and cooling rate). Different process methods can make the mould to meet the different conditions of use and different performance requirements. From the view of mould life, to meet the requirements of the hardness is only one aspect of the technical requirements of the mould, it also has some performance requirements, such as strength, toughness and so on. Mould quality is good or bad can not be completely identified by the hardness index, it is impossible to use the hardness measurement method to test the life of the mould, heat treatment as a special process, it can only through process validation, performance testing, reasonable process parameters, and strict implementation of the identified process parameters (process control process) to ensure product quality reliability and stability. A large number of data show that the vacuum heat treatment . of cold stamping die deformation is small, very few line cutting cracking, grinding phenomenon. Die-casting mould using advanced technology to a certain extent, reduce the mould crack and the use of viscous phenomenon.